SOWERS International is an organisation that trains churches to be able to reach out to their community through outdoor evangelism. Nepal is one of the newer countries they have become involved in and the work is growing rapidly. This partnership is to support the key person, Nabin Darlami, for a period so he can grow the ministry. It is crucial that some time be given to this stage of development. Nabin has been involved with SOWERS for a number of years as a volunteer. During that time many churches have been trained. He has been trained to Level 4 which means he is able to teach people at Levels 1 and 2. He is often out with others doing the training and following up with churches. In early 2014 he left his role as a pastor to become full time with SOWERS. Bright Hope World has been partnering with SOWERS International in Africa (INT02) since 2002 and we have a strong relationship with them. We have been very impressed with the quality of the people leading their programmes, the very clear training process that has been established, the accurate data that is kept and reported, and the very large number of people who come to faith because of the training. Late in 2013 SOWERS approached us regarding the prospect of Bright Hope World financially supporting one of their key people. The SOWERS International people have known Nabin since 2006 when they first met him in the Philippines. Later that same year John and Winsome Edwards went to train his church in the SOWERS program, at his invitation. 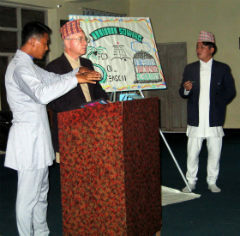 In subsequent years they have visited Nepal to train Nabin and to work together in conducting seminars in many places. The beneficiaries are Nabin's family and the ministry of SOWERS International in Nepal. 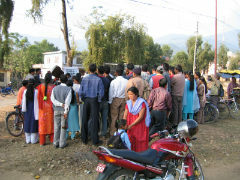 Nepal is a critical place in which to see the church established and growing. There is a good network to oversee his development. He seems to be a really good guy and highly motivated. Nabin is married to Hannah and they have three children: a girl aged 16 and two boys 13 and 10. He was converted from Hinduism and accepted Christ in June 1990. He was then baptised on 7th April 1991. Nabin attended Bible College in Kathmandu for three years and graduated with a Bachelor of Theology degree. Much of the study was done in English! He became an evangelist in his local church from 1995. He then served as assistant pastor for 9 years, from 1995-2004. Subsequently he served as pastor of the same church until 2014. When he started the church had approximately 30 members. Today church membership is about 250 people. As well there are multiple daughter and granddaughter churches which Nabin has been overseeing. Nabin is a gifted preacher/teacher and loves the SOWERS program. He has a real passion for evangelism and to see his country reached with the Gospel. He sees the SOWERS program as a great way of achieving this. Nabin is also a gifted church planter. He has been involved in planting at least eight churches since 2006, with the help of his church SOWERS team, with converts won through SOWERS open air meetings. Hannah is very active in womens' ministry and she supports Nabin 100% in his work with SOWERS. The vision here is to support the key person in this growth phase of the SOWERS work. Their main strategy is to run seminars in churches to help them reach out into their own communities. There are a number of levels of training within SOWERS. The main training is with church members who want to become team members. They have to learn how to preach in the open air, how to be a good team member, how to lead someone to Christ and to prepare sketch boards for presentation. 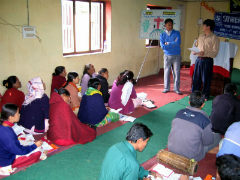 Once they have been trained, they cannot go on further until they have participated in at least 10 open air programmes. The annual budget here is US$3,300 with an initial three year commitment which will be reviewed annually.